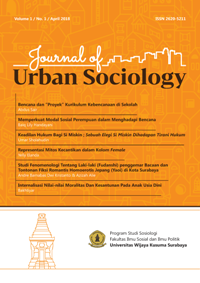 Journal of Urban Sociology (JUS) is a scientific journal published by Sociology department of Wijaya Kusuma Surabaya University periodically (twice a year). JUS tries to be both a new ideas and research presentation forums for lecturer, researcher and community in order to expand the knowledge especially sociology. JUS also oriented to be an original source of thinking of metropolis, multiculturalism, identity, poverty and environment in urban areas. axial adalah Jurnal Rekayasa dan Manajemen Konstruksi yang diterbitkan oleh Program Studi Teknik Sipil, Fakultas Teknik, Universitas Wijaya Kusuma Surabaya sejak tahun 2012 dengan ISSN:2337-6317 untuk terbitan cetak. axial merupakan jurnal yang berisikan tulisan yang di angkat dari hasil penelitian, kajian, dan telaah kritis dibidang ilmu ketekniksipilan dengan konsentrasi ilmu rekayasa struktur, bangunan air, manajemen transportasi/lalu lintas, manajemen konstruksi, dan geoteknik. jurnal axial diterbitkan tiga kali dalam satu tahun, antara bulan April, Agustus dan Desember. Scientific Journal of SOSIO AGRIBIS was first published in 2001 based on the Rector Decree University of Wijaya Kusuma Surabaya No. Kep. 36/UWKS/V/2001 dated on May 1st, 2001, with biannual frequency of publication, in July and December. This journal contains writings in the form of research articles and review related to agribusiness. With the name change on the study program of socio-economic into study program of agribusiness and in line with the up to date development, then in 2017 this journal changes by accommodating on-line publications without eliminating print publications. Editorial Board : Ir. Nugrahini Wisnujati, M.Si, Ir. Koesriwulandari, MP, Ernawati,SP , M.Si, PhD. Welcome to the official website of EQUILIBRIUM journal, is a scientific journal that addresses economics, management, and accounting issues. EQUILIBRIUM journal is a peer-reviewed journal that publishes scientific articles in the field of economic, management and accounting. The published articles are the results of original scientific research and scientific review. EQUILIBRIUM journal is published by Research Institution and Community Service Wijaya Kusuma Surabaya University. EQUILIBRIUM journal accepts any manuscripts or articles in the field of economics, management and accounting studies from both national and international academicians and researchers. The articles published in EQUILIBRIUM journal have already been selected and reviewed by Mitra Bebestari as the peer-reviewers. The acceptance of articles in this journal is the right of Editorial Board based on recommendations from Mitra Bebestari. EQUILIBRIUM journal is published twice a year (in April and October). Submitted article should follow The Writing Guidlines. Jurnal Ilmiah Kedokteran Wijaya Kusuma (JIKW) is a peer reviewed periodically scientific publication that contains articles written in the Indonesian or English language . JIKW receives articles in the filed of Biomedical Sciences, Clinical Sciences, Public Health and Medical Education. JIKW published twice a year. JIKW only publishes manuscript that have never been published in other journals. Authors who wish to publish in JIKW need to follow the JIKW guidelines. The manuscript submission and peer review process are done online.